Empty nesters have spent years thinking about other people - now it's time to focus on themselves and what they really like. Go for something for them - not for the kitchen or garden. And the more self-indulgent the better! A gift voucher to try something new - a riding lesson? a writing course? Dancing lessons? Empty nesters are keen to try new activities - but they often appreciate a nudge in the right direction. So a book or voucher are great ideas. http://www.creativebreaks.co.uk has Christmas vouchers for a variety of courses. Two photograph albums - one for nostalgic family pics, the other for the adventures ahead. For me the problem is the title. Would anyone dream of calling a rom-com '35 and Over'? There's a suggestion that it's a bit weird for the over 55s to have anything going on in that department beyond the standard male mid-life crisis stuff. Yet the stats indicate that for a lot of people this is one of the most exciting - if turbulent - phases of their emotional life. There are studies which show that many marriages improve when the kids leave home, because couples have quality time with each other. And if things don't improve the stats show that people do something about it (i.e. divorce - it's the one age group where divorce is rising). And it's often women, not men, who want things to change. The sad thing is that the over 50s tend to be reluctant to seek relationship counselling. 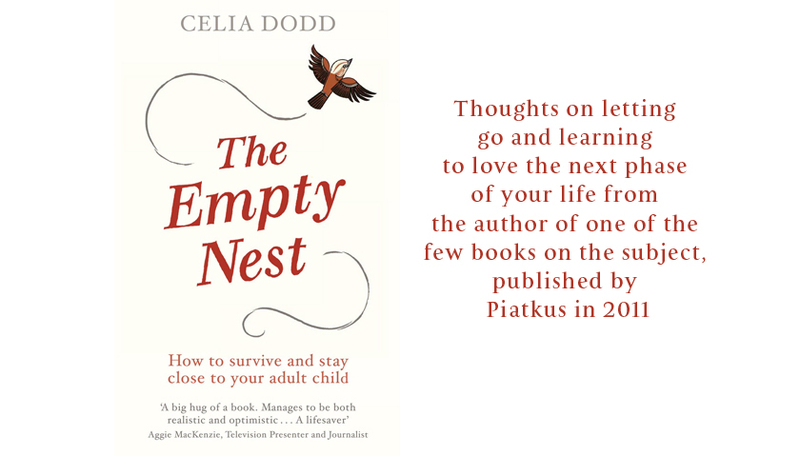 It's half term this week, but not if you've got an empty nest. For those of us whose kids have left home half term, like Hallowe'en and Bonfire Night, is yet another poignant reminder of the way life used to be, and of all those precious bucket-and-spade moments which were fun because they were shared. Going on holiday without children came up on the Robert Elms Show on BBC Radio London at the weekend. He was just back from his first holiday without his three and he'd found it a bit weird - a strange mix of liberation and sadness. Talking to him about it on the show - which also featured Cambridge psychologist Terri Apter - made me remember how much I used to hate the idea of holidays without the kids. I'll never forget the empty nest couple we met on our last family holiday, and how superior I felt to have my family with me - I looked at them with a mixture of pity and dread. I couldn't see that in fact they were having a whale of a time (although it was pretty obvious that they were - getting up late and wandering off through the pine forest hand in hand). But then I had a bad case of tunnel vision. It was the summer just before my eldest went to uni, and I was missing him already. I couldn't begin to imagine how you could enjoy a holiday - or indeed life - without your kids. I can now! Eight years on I almost wonder why I enjoyed family holidays so much - all that worrying and taking five hours to get out of the door. So what's changed? It's partly just getting used to the way things are now, and enjoying the new focus on just us - being carefree and selfish, basically, getting up when we want to and doing exactly what we please. Of course, if we'd done what all the experts advise, and gone on holiday without the kids in the years before they left home, those first child-free holidays might have seemed less daunting. But we never did. It was partly fear of teenage carnage if we weren't around to stop it, partly that there was no one willing to take our three on for a week. But it was much more that we just didn't want to leave them. We wanted to go on holiday with our children. So it was bound to be sad when that era came to an end. Looking back I can see that booking that first holiday for just the two of you requires a big leap of faith. Before you go it may be hard to imagine what you'll find to do or say without the kids to shape the days or badger you into a decision. It's not until you have a real chance to unwind and spend time with each other that you see how a holiday can bring you closer and help recall what got you together in the first place. * Choose your destination and timing carefully. Out of school holidays may be cheaper, but you could find yourself surrounded by other middle-aged empty nesters! * Don't go back to places where you had lovely family holidays. * Make the most of freedom: go for destinations and activities the kids would have hated. * Don't always go with friends; it's a bit of a cop out. This is your time. * Give yourself permission to please yourself - it can be a surprisingly difficult habit to get into after years of pleasing everyone else! Father's Day on Sunday, not a day we remember very enthusiastically in our fam, either now, or when I was growing up. But it does make me think about dads and the empty nest, and how, when I was writing my book, I totally bought into the idea that fathers feel their children leaving just as much as mums - albeit in different ways. I interviewed loads of dads, like wonderful Charlie from the Fatherhood Institute, who went on a kind of extended bender when his daughters left - an inspiration to us all about getting the most out of life. All of them felt their children leaving deeply, and thought long and hard about the impact on their lives, and the crisis it could precipitate. Yet I failed to see what was going on under my nose, and how my own husband was feeling about our kids going. Perhaps I was just too wrapped up in my own sadness. But in my own defence I have to say that like a lot of men, my husband doesn't wear his heart on his sleeve - and I felt he was faintly critical of my own frank emotions about the kids going. By contrast he was resolutely positive: every time I whined he'd say how proud he was that they were making their way in the world. Looking back that's just what the kids - and I - needed him to say. It was only when I interviewed him for a feature about Dads and the Empty Nest for the Daily Mail http://www.dailymail.co.uk/femail that I realised how it had got to him. He said he felt redundant: it used to be 'Dad! Dad!' as soon as he walked through the door from work, but now the house was silent. Our three kids going had changed his life in a way he hadn't anticipated, and perhaps still didn't acknowledge. This brilliant piece, 'What will you feel when you have no children left to wave goodbye to?' by novelist Nicci Gerrard says it all. I haven't tidied her room either. My eldest's room is full of junk too, and he moved out eight years ago! Even though I'd love his room to work in, or make it nice for visitors - even another lodger! - I just can't bear to ask him to clear it out. When that happens it will be a breakthrough of sorts, but in the meantime I suppose I'll just carry on shoving his stuff into a corner. The Boomerang Generation bites back! 'Cuckoo in the Nest: 28 and back with mum and dad' by Nat Luurtsema (Hodder & Stoughton) is a 20-something's account of moving back home. Nat is a gimlet-eyed stand-up comic and some of the domestic detail is blush-makingly familiar. But it's always good to see the other side. The chances are that it's harder for them than it is for you.